Five years ago, Monday nights in Detroit were just like any other. Now, they’re a celebration of cycling, community, and the city. Every Monday night between spring and fall, this is the chant echoed loud and proud in the streets of Detroit. It’s recited by everyone from black teens on lowriders and white hipsters on fixed gears to senior citizens on road bikes and suburban families who’ve come downtown for an evening cruise. Outside of metro Detroit, the chant may not be the most familiar element of Slow Roll. Instead, it might be the yellow shirts of “squad,” Slow Roll’s safety personnel, as seen in an Apple iPad commercial last year. Or maybe it’s the river of riders flooding the streets of London or Chicago in a Slow Roll offshoot of their own. Or maybe it’s the black dreadlocks of Slow Roll co-founder Jason Hall and the bushy beard of fellow co-founder Mike MacKool. Whatever Slow Roll’s trademark is, you’ve likely seen or heard or read about Michigan’s largest weekly community bike ride before. 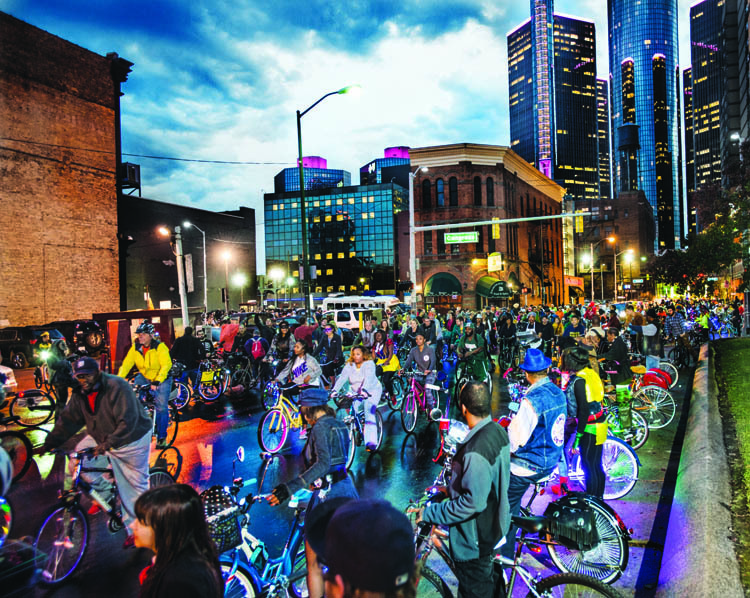 In the past five years, Slow Roll has become the poster child not only of a growing bike community in modern Detroit but also the modern Detroit community at large. And in the discussion of Detroit’s future, where the terms “rebirth,” “renaissance,” and “recovery,” are beginning to lead, “Slow Roll” is never far behind. It’s a phrase and a brand that, whether chanted or spoken, has become a source of city pride, an emblem of community, and if nothing else, an invitation to a good time. The Slow Roll origin story is a short one, at least according to Hall. In 2010, he and MacKool met through a mutual friend, and despite a 10-year age difference, Hall, then 35 and MacKool, 25, hit it off right away. Over the next few months, the two Detroit residents bonded over two hobbies: video games and bikes. The company was Bikes and Murder, and with his background in the marketing and entertainment industries, Hall knew that if their T-shirts, hoodies, and stickers were going to sell, he and MacKool needed a creative way to get them to the people. For that, they would turn toward their bikes. to see what was brewing beneath the surface. Until that moment, Hall says he hadn’t truly looked around, and when he did, he saw a rapidly growing number of riders young and old, black and white, experienced and new. Slow Roll today is a far cry from two T-shirt entrepreneurs with a dozen riders in tow. 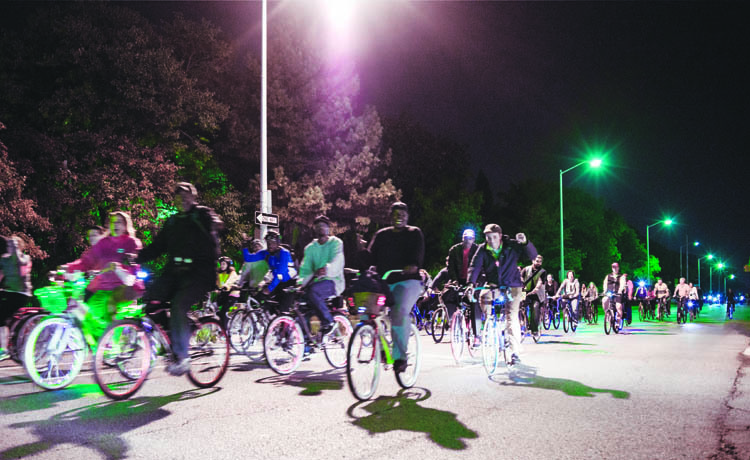 In 2014, weekly rides drew an average of 2,000 riders with a peak of 4,000 packing the streets on cool summer nights. Roads are now blocked off by squad to ensure safe passage, and there are even official sponsors like Shinola and New Belgium Brewing Company. For Hall and MacKool there have been personal changes, too. 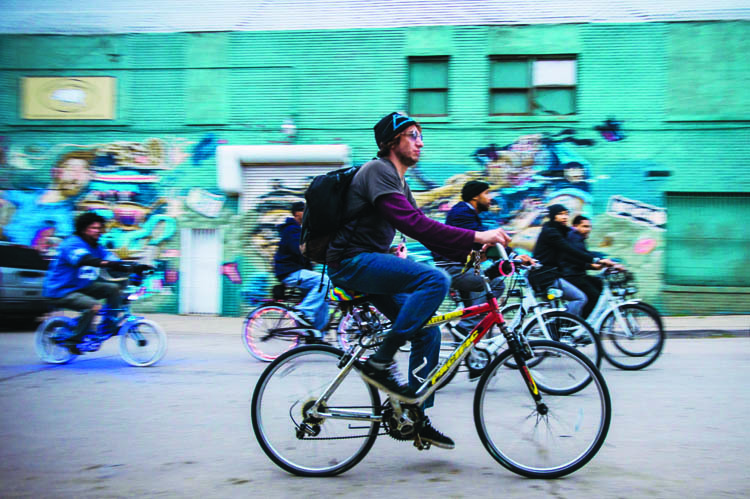 Between Slow Roll and North American Bicycle Week—events organized by Detroit Bike City, Hall and MacKool’s organization dedicated to promoting cycling in Detroit — bikes have become a central part of their work lives. 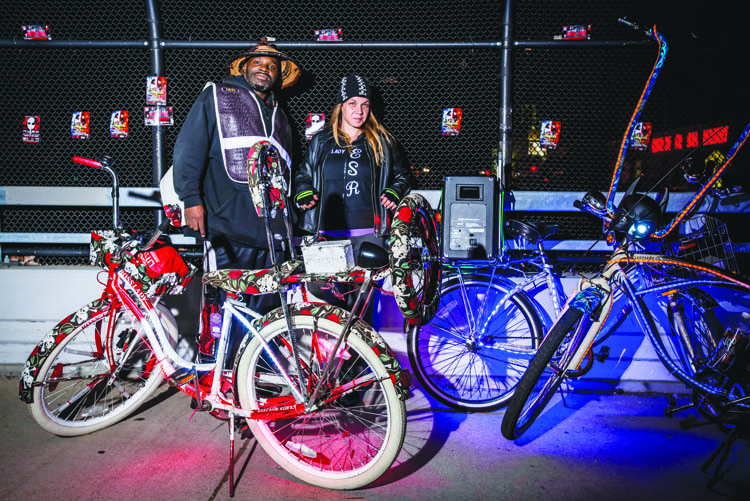 MacKool says the pair has always shared organizational duties at Detroit Bike City, whether that’s making fliers or planning routes for the Slow Rolls, but as with any partnership they each play to their strengths. “I have always been heavy in making routes, creating the code of conduct, doing the announcements, crowd control, [and] leading the ride,” MacKool says. 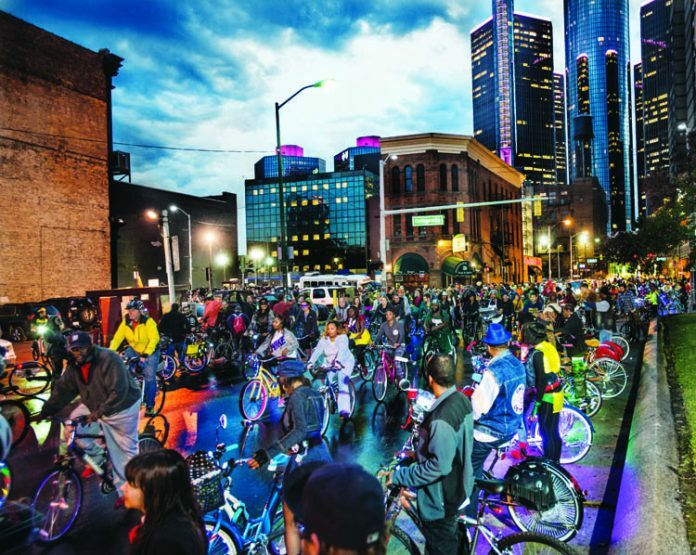 And while MacKool typically leads the Slow Roll pack in Detroit, Hall leads the charge on the road, speaking at schools and conferences like TEDx where he touts the health, environmental, and community benefits of cycling. Last year, he also toured as a spokesman for Apple. Ah yes, Apple. The company has been kind to Slow Roll following its 2014 iPad commercial. The 30- and 60-second ads, which first aired last August, feature Hall and his ability to coordinate Slow Roll with the help of his trusty iPad and organizational apps. The publicity led to news stories, national headlines, and an appearance on Esquire Television. If Slow Roll didn’t already have the attention of the Detroit community before, it did post-Apple commercial. The level of interest and the number of riders have both increased since the commercial aired, and although the growth initially gave Hall cause for concern, he says his expansion worries will be less for the 2015 season, since the city has stepped in to help. For the first time, city police will be riding as part of the Slow Roll pack, helping to block off streets and ensure safety. Hall understands that this might cause some friction among longtime Slow Rollers, but he considers it a necessary adjustment. But aside from the inevitable changes that come with the kind of growth Slow Roll has seen, the ride has stayed true to its mission of community building and self-expression. Slow Roll isn’t like a lot of other group bike rides. It’s not about going fast; it’s not about winning. It’s about “seeing a city for what it is,” as MacKool explains it, whether that’s cruising through a struggling neighborhood or meeting up at a downtown hot spot. 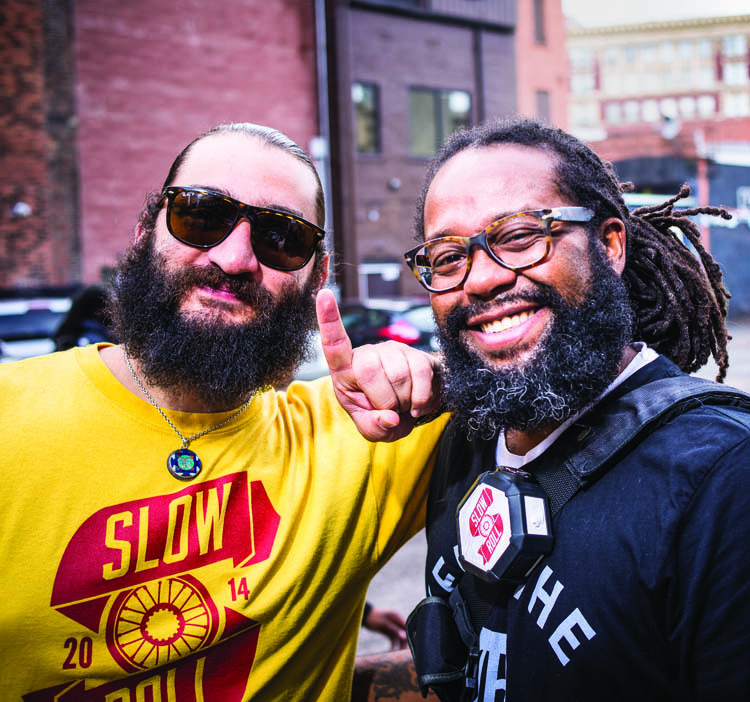 No matter the route, Slow Roll offers “a great opportunity for dialogue,” according to Hall, and whatever social divides may exist within the city’s borders or beyond, part of Slow Roll’s mission is to break them down. Slow Roll doesn’t like barriers — social, physical, or otherwise (though traffic barriers are admittedly a plus). The ride has inspired numerous people to hop on a bike who may not have otherwise, and it’s even led some to set down roots in the city. 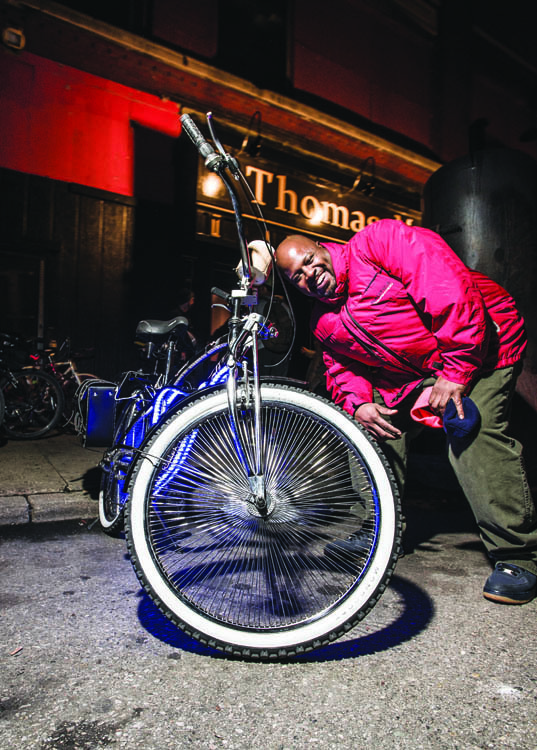 Slow Roll has also helped sustain an entire subculture of custom bikes, particularly among Detroit bicycle clubs like East Side Riders, Grown Men on Bikes (GMOB), and Grown Ladies on Wheels (GLOW) — three groups that are helping to break down barriers on their own. 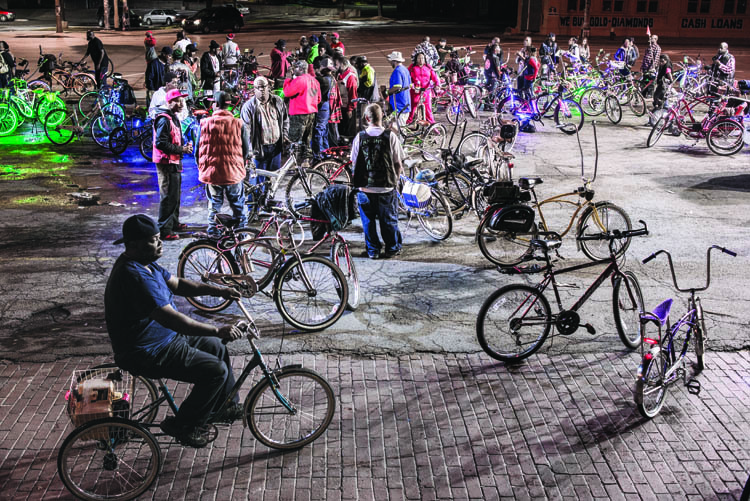 What you see in Detroit’s bike clubs are men and women who are just as crazy about bikes as any other cycling subculture. You see denim jackets with official club patches. You see LEDs, boom boxes, radios, and barbecue grills attached to chrome and neon frames. 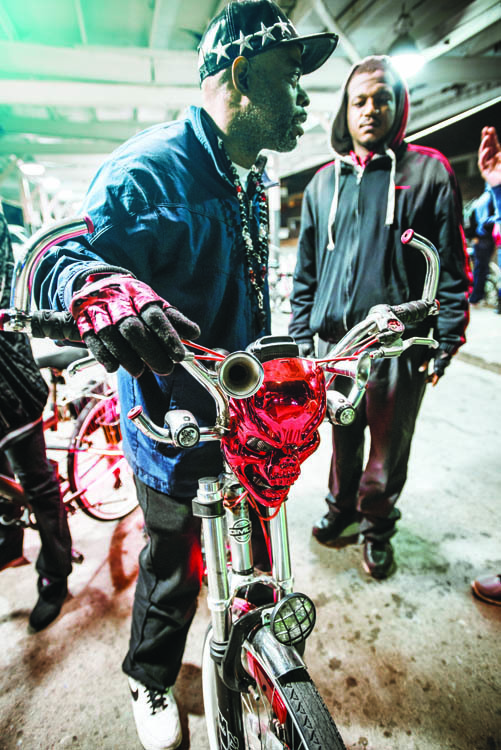 East Side Riders founder KingWayne Neeley says ESR’s bikes weren’t always so flashy, and when the group first formed, they salvaged what they could to rebuild and decorate, using everything from discarded couches to spray paint. 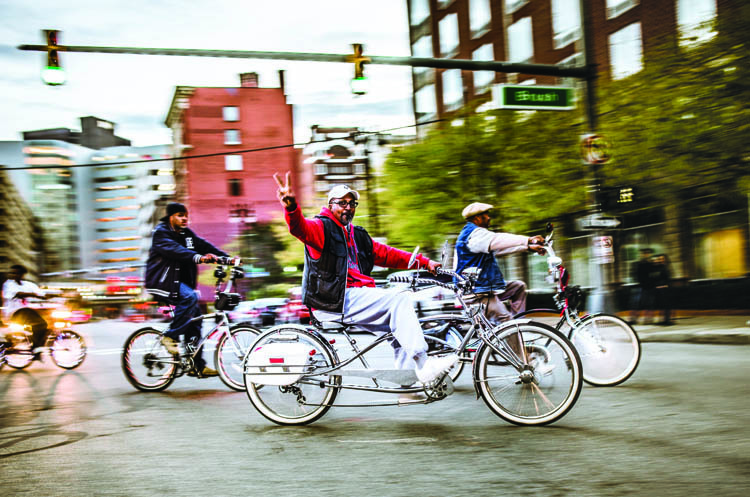 Now, Neeley says, when they roll through a neighborhood, “people pretty much clap,” and the ability to showcase their original work is one of the reasons the club initially embraced Slow Roll. As much as clubs like ESR enjoy Slow Roll for the chance to be seen, Hall says the friendship is mutual. He and MacKool originally invited Detroit’s bike clubs to bring their flash, music, and energy to the ride, but the clubs brought even more. 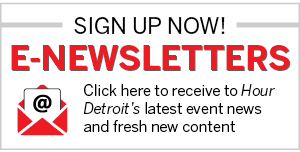 As Detroit looks forward, Slow Roll does, too. Hall and MacKool plan to take the ride, or at least a version of it, everywhere from Grand Rapids to Atlanta. Closer to home, Hall and MacKool also plan to expand Slow Roll’s reach outside of downtown into neighborhoods like Brightmoor and Southwest Detroit. And although Slow Roll’s future is always in flux, Hall says he’ll continue to do everything in his power to ensure that as both the ride and the city that gave it life continue to grow and change, the driving force behind Slow Roll will be those who ride. Slow Rolls for 2015 were scheduled to start in late March. For more information, visit slowroll.bike.